In 1970s Brazil, two political dissidents dump their 12-year-old son Mauro (Michel Joelsas) at his grandfather's apartment in São Paulo, then drive off as fast as they can. But Mauro's in for some rude surprises. His grandfather just died. His parents are fleeing arrest. And he's about to spend the summer living in his grandfather's empty flat -- raised by a village of devout Jews, activists and soccer fans. 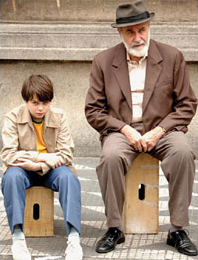 "The Year My Parents Went on Vacation" is a sweet, intelligent little movie that adopts its 12-year-old's hero's point of view: As the world around Mauro erupts in political violence and World Cup fever, he seems almost as worried about Pelé (and peeping) as he is about his family. Through Mauro, co-writer/director Cao Hamburger captures the terror and excitement of the transitions of youth and 1970s Brazil -- no mean feat. And Joelsas does an incredible job carrying a movie on his tiny shoulders.